Oh New Look, you really do spoil me! 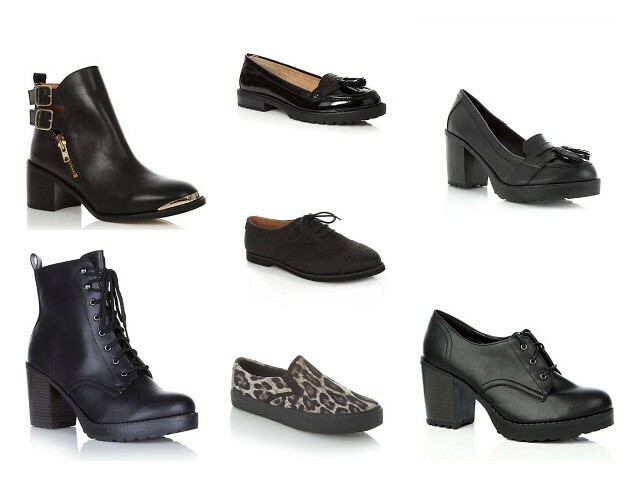 I love black shoes, the chunkier the heel the better and if they are under £30 then I'm in heaven. New Look are always my first stop when it comes to finding affordable heels. I always go there if I'm looking for cheap shoes for a night out and you can always pick up something that Topshop sells for half the price in New Look. My favourite heels are from New Look (wearing them here) and they were only £18. AW13 is going to be all about the punk look with some 60s mod influence thrown in for good measure. The lace up boots are great for wet and cold weather and have a punk feel and the loafers and brogues would look great with a shift dress. Also, the plimsolls are leopard print with grey and one pair of boots have gold on so you can't complain that all my choices are boring and black ;) A girl can never have too many pairs of black shoes, right? I desperately want those lace up boots!! !